A popular choice for high street and outlet stores, this style of rolling or mobile rack provides the perfect way to store large volumes of product within what are often very small and restrictive retail stockrooms. Roller racking units are designed to reduce the number of access aisles within a stores area, this allows more racking bays to be installed which greatly increases stock capacity. 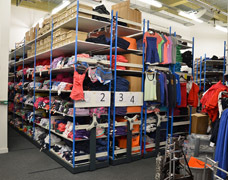 Many retailers (especially those selling clothes and shoes) have a large inventory to cope with and seasonal demands can make it difficult to retain an organised and efficient stockroom. 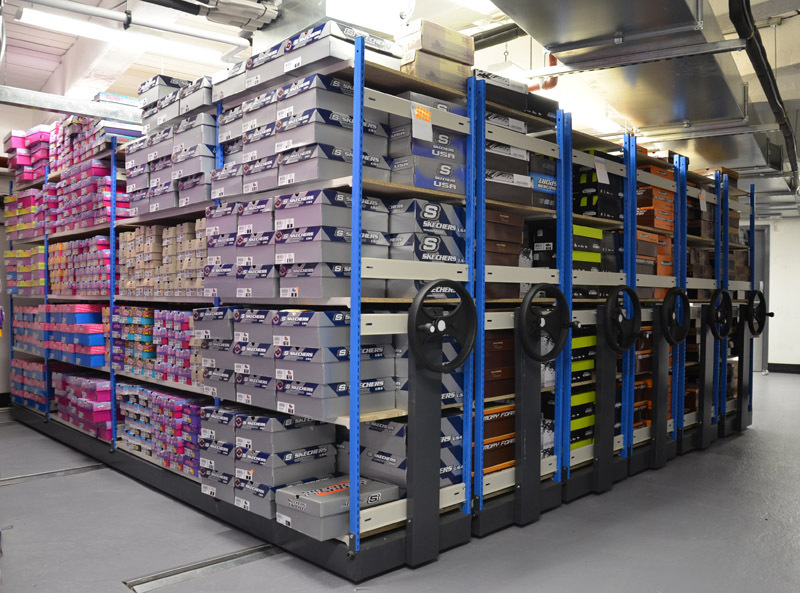 Stockroom roller racking can easily provide a 75% increase in stock capacity over conventional static shelving - providing enough space for the current and future stock holding of a growing business. 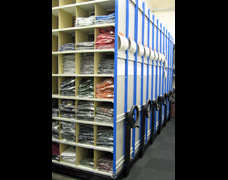 Mobile stockroom racking can also be used to reduce the size of the room required by around 30%, this affords more space to be allocated to the sales floor to possibly generate increased sales or to create space for admin or packaging duties. The use of movable racking can effect the viability of a smaller retail unit and enable the use of sites that were previously considered too small. 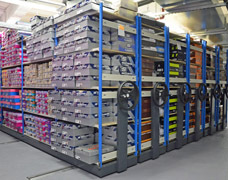 Roller shelving systems are designed to suit the number of users and a wide aisle can allow 2 or 3 people to access the system at the same time. Units are lockable for safety and security. 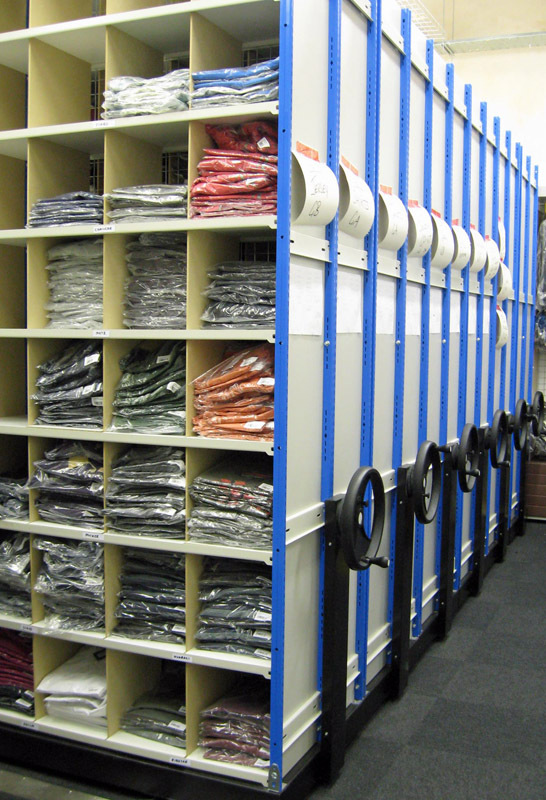 Each mobile racking solution is generally made to each client's specific requirements, every retail business has different needs and we endeavour to go the extra mile to supply solutions that work perfectly with your stock profile. 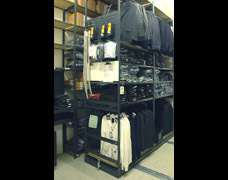 A good example is the stock racking system shown in these photographs, this unique design makes use of our Trimline shelving system to provide hanging rails for jackets and coats, and standard shelves for folded shirts, shoes and accessories. The rack ends are fitted with slat panels for hooks to provide additional storage space for small items and wipe boards enable the racking to be marked with stock location information. 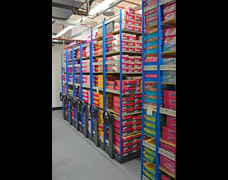 The roller racks were part of a complete stockroom shelving solution that provided a place for everything, giving maximum stock capacity within the smallest possible space. Bespoke shelving trolleys were incorporated within the storage shelving to enable stock to be taken to the sales area for ease of merchandising. A pre-retail bench provided space for stock to be prepared with plastic bins for tags and sticker rolls, filing trays for documents and a magnetic panel to display paperwork. This is a great example of how our modular shelving systems can provide the perfect storage solution in any stockroom environment. The stock racking units for this large project were finished in special black colour to match the retailer's brand image. 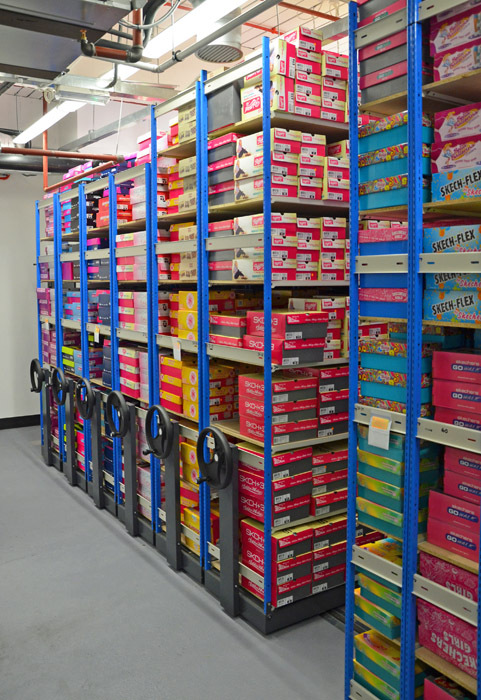 The application (right) shows a mobile shelving solution for a leading fashion retailer providing 600 linear metres of shelving capacity including 1600 pigeon hole compartments. This stockroom itself was only 50 square metres in size, if conventional racking was used the room would have needed to be 80m2. The use of roller racking provided 30m2 of additional 'retail' space, and the cost of the space saved paid for the capital investment in only 3 months! High density mobile shelving is widely used to reduce the stockroom space required, each solution is tailored to suit the space available. A single access aisle was incorporated to provide the maximum stock capacity, each storage section is simply accessed via an easy to use rotating hand-wheel. Push button safety locks ensure that units stay securely in place whilst the stock is retrieved. The pigeon holes are mounted onto mobile bases which run along a low profile floor track with tapered edges to help to reduce possible trip hazards. 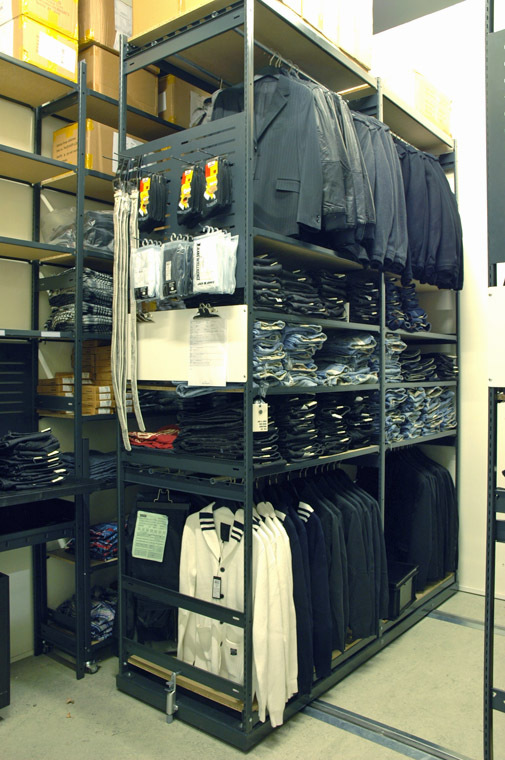 We provide high quality mobile stockroom racking solutions to many of the leading UK fashion brands - helping them to make the most of their stockrooms. We offer a free design and planning service and we would be pleased to arrange a site visit to discuss how roller racking solutions can improve your business.